Steve is the son of John and Katherine Shindela and was bom in Sandy Lake. Helen, daughter of Michael and Anna Borys, was bom in Cedoux, SK. Steve and Helen were married in 1949 in St. Anthony's Church. 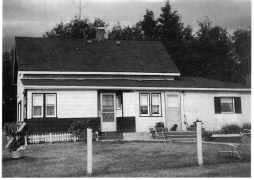 They farmed in the Sandy Lake area until 1987, when they built a home in Erickson and moved in 1988. They have three children. Geraldine married Garry Ferguson and they live in Port Moody, Be. Louise married George Follows and they live in Winnipeg. Leslie lives on and farms the home farm. Steve and Helen have two grand­ children, Cody and Paige. Steve and Helen are active members of st. Jude's Church. Helen is treasurer for st. Jude's Ladies of the Altar and Steve is on the cemetery committee. Steve also belongs to the Knights of Columbus. Helen is Agriculture Convenor for the Women's Institute and is on the Erickson Crossroads Centre Board. Steve and Helen have done a lot of traveling. They have visited almost every state in the United States, and have been to Hawaii, Cuba, Dominican Republic, Mexico, England and many countries in Europe. As the Adolph Sillen family moves into the new millennium, they count their blessings and reflect on some family highlights. memorable trips was a five-month trip to various places euroute to Australia and New Zealand, which was a gift from Emily's brother and sister-in-law, Dennis and Edwina Marsh. During their life together, they were able to cele­ brate many special milestones. 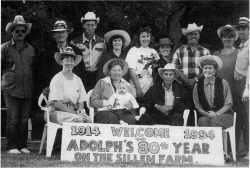 The last big event was the gathering of family, friends and neighbours in honour of Adolph's 80 years on the Sillen farm. In 1996, Emily (October 18, 1920) went on a delight­ ful bus trip to Alaska, accompanied by her friend, Sadie Northcott. In 1998, after 60 years on the Sillen farm, Emily decided it was time to move to Minnedosa. She is presently living in the Prairie Oasis Four Plex where she enjoys frequent visits from family and friends, numerous card games, weekly bingo, the making of quilts as well as look­ ing after her comfy home and array of summer flowers. Emily loves spending time at her home in the country that is filled with many fond memories. She continues to be an active member of the Erickson Lutheran Church and community. Emily finds time to travel and makes frequent visits to Winnipeg, Thunder Bay and BC, visiting family members who include her 3 grandchildren and 3 great grandch iIdren.